This process encourages the use of simple materials and supplies that are inexpensive and often available at discount stores in the art/craft aisle. You may even have some of them around the house, especially if you have children. Yet it is also fine to use artist quality materials, as long as you are able to let go of the need to make "good art" and let yourself experiment without regard to the artistic outcome. Below are various options that you can use depending upon what is available or what you can afford. Basically, I encourage you to have a drawing media and a painting media and just about any combination can work, it doesn't have to be the combinations that are listed below. 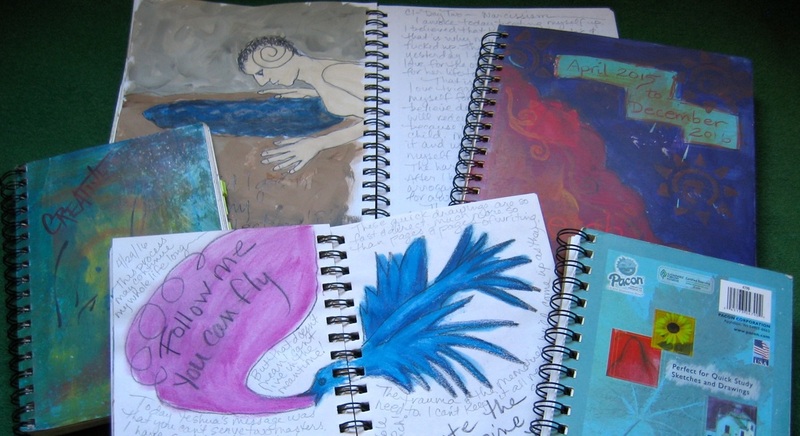 For this process I tend to use spiral bound art journals that are inexpensive and available in discount or craft stores. Some have thinner paper for drawing and dry media, while others will have a bit thicker paper that is better for painting and wet media. But I have found that either work fine for this process. Ideally the book or journal will open and lay flat while you work and I prefer at least a 10"x8" size or larger to allow more freedom of movement. Smaller ones I reserve for travel journals. One of the simplest and cheapest options is a basic box of crayons and a set of tempera paints. This is especially nice if you like to get messy and use your hands because they are easy to wash up. They also evoke the feeling many of us had as children because they were the first materials we used to begin to explore expressing ourselves creatively. Remember, this is more about exploring uncensored creativity than it is about artistic prowess, so these can work as well as anything. Brushes can be simple natural bristle, chip brushes for house painting or sponge brushes, especially if you are working a bit larger. Oil pastels are fun to use for gestural mark making and if you like to smudge and smear the lines when you draw. 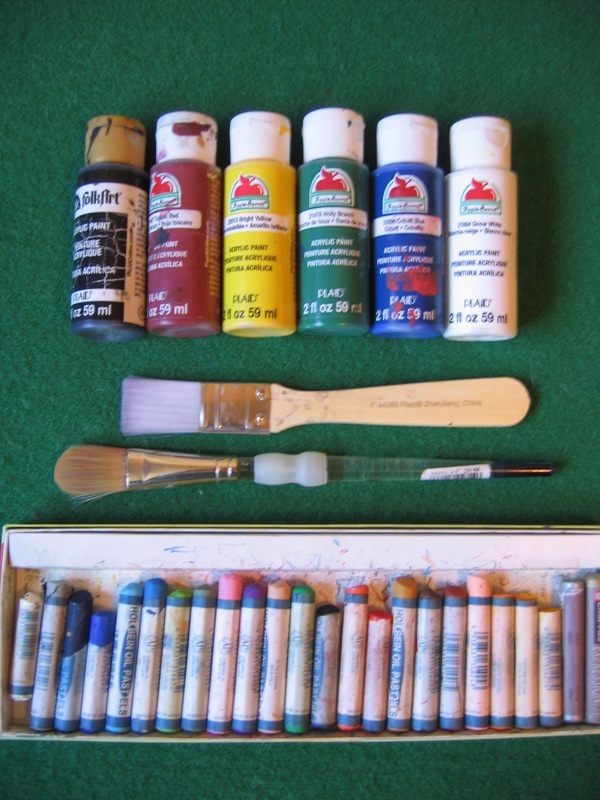 It marries well with cheap, craft acrylic paints, which are fluid and come in little bottles rather than in tubes. I prefer the matte finish acrylics because they make a good base layer that you can use other media on top of. Choose a basic set of colors that appeal to you including black and white. Both materials are generally available in discount stores or art stores. This image shows a nylon, chip brush and an artist brush with synthetic bristles. Matte Acrylic Medium - I also use a lot of clear acrylic matte medium to get translucent layers and other effects. You can also use gloss acrylic if you prefer, but often it is too shiny to draw or paint over when it is dry. 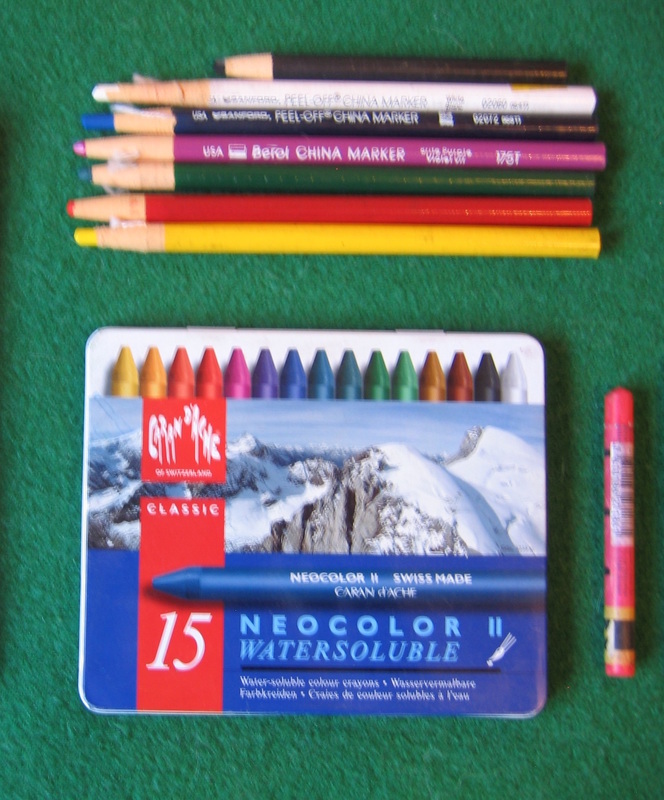 China markers are wax based pencils that come in a variety of colors, but may need to be purchased online or in an art supply store. But they are a nice way to make quick, bold lines with more detail and color than children's crayons. Water Soluble pastels are a wonderful way to get both lines and watercolor type effects in one material. Neocolor II is an artist quality pastel that is only available online or in art supply stores and is fairly expensive, but worth it if you see yourself doing more of this in the future. 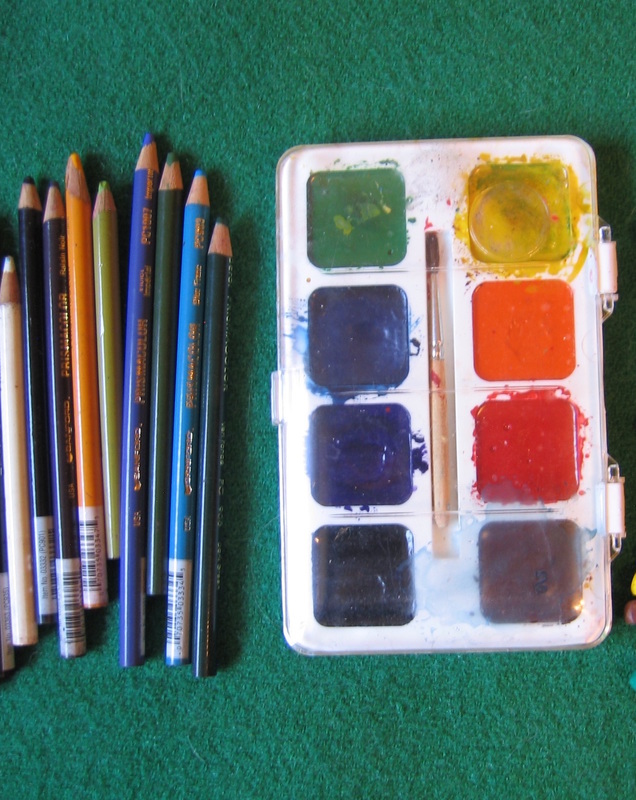 A cheaper version is made by Crayola and is called Portfolio Water Soluble Oil Pastels, which are very reasonably prices, but generally need to be purchased online too. They go on like a crayon, but can be blended with water or a wet rag to make subtle gradations. I often use this combination for travel journaling or in bed with my morning tea because I don't have to have water and brushes. For smaller journals, colored pencils can work well and come in a wide array of colors. However, they often encourage more attention to detail, which can tighten up the spontaneous quality of the Creative Inquiry process. Watercolor is also a readily available medium for painting with, but you need to get a journal with thicker, mixed media or watercolor paper in it to avoid lots of cockling and buckling once it dries. Various drawing media can be used to enhance your images and bring out detail and definition. They can also be used to write words under, within or on top of your images with interesting effects. Charcoal pencil or compressed charcoal give a dark, black line and can be smudged and smeared for blending and shading. They can also be painted over with acrylics because they don't have any wax or oil in them to create a resist. An artist's Graphite pencil is just a thicker version of a regular pencil that you can use to press down hard without worrying about breaking your lead or tearing the paper and it also won't resist acrylic paint. Lastly, permanent markers like Sharpies now come in an assortment of sizes and colors, including metallic and also acid-free, fine tipped for art and craft use. They will sometimes bleed through the paper and come through acrylics if you try to paint over them afterward, but they offer quick bold lines. Many people like to use images and words that are cut or torn out of magazines or old books. I also sometimes make copies or prints of photos of myself, my childhood or my life to use in my visual journaling too. Yet for this Creative Inquiry process, I encourage you to keep things fairly simple so that you can create an image in 5 - 15 minutes in order to be able to do it everyday if possible. So it can be useful to have a box or folder of images and words that you have already cut or torn available to use as needed rather than having to rifle through books and magazines once you're ready to begin the process. This piece includes a meaningful quote and a photo of me that I overpainted with acrylic.